Students at the University of the West of England are campaigning to bring a Palestinian student, currently suffering because of Israel’s crippling blockade of the Gaza Strip, to come and study at UWE. In January 2009 a group of around 30 students staged an occupation at the university, to protest against Israel’s deadly “Operation Cast Led” attack on the Gaza strip, which had claimed over 1,400 lives and left many others injured, homeless and malnourished. 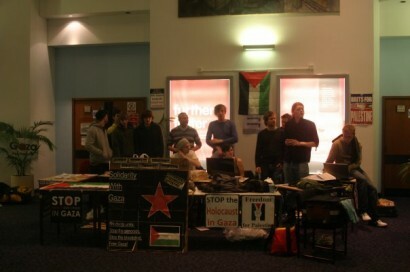 The students occupied the space for 3 nights and presented the university with a list of demands, the most significant of which was that the University provide fully paid scholarships for Palestinian students in Gaza to study at the University of the West of England. Two years on, the University has agreed to fund one fully paid scholarship at the cost of around £45,000 a year. However, this is on the condition that the donors raise the first £5,000 pounds. Once this has been achieved, the University will fund a full scholarship for a Palestinian currently living in the Gaza Strip. This will profoundly change the life of someone currently suffering because of the blockading of Gaza by Israel. The students are now in the process of raising £5,000. They aim to raise the money by June this year, which would allow a student from Gaza to start studying as early as September 2011. In order to raise this money the students have decided they need to look outside the university for private donors. So far the students have managed to raise £3,575, with Viva Palestina donating £2,000 towards the cause. The aspiration is for the Conflict Zone Bursary fund to run every year and function as a lasting legacy, with the University providing scholarships to students from war-torn countries. Each year the country will be chosen by the donors. To track progress, read more or donate please visit the campaign website.